SEOUL, Aug. 14 (Yonhap) -- Yonhap News Agency has introduced an automated reporting system to produce news on English Premier League (EPL) football games, a key milestone in its efforts to improve coverage and expand technology-based journalism. 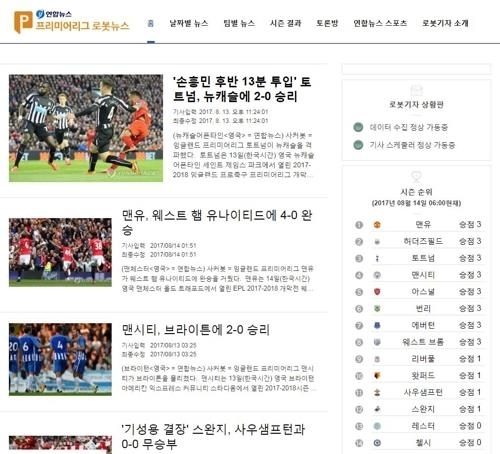 The key news wire service of South Korea on Monday unveiled its Soccerbot software powered by an algorithm which imitates the way human journalists write. The system developed by the company has been on a pilot service after a successful test in covering all games of the 2016-17 EPL season. Soccerbot produced a total of 380 automatic experimental articles, each within one or two seconds of game's end. Yonhap said it will develop another program to cover the PyeongChang Winter Olympics slated for February 2018. Soccerbot has been used to produce Yonhap's Korean-language articles starting with Saturday's 2017-18 season opener between Arsenal and Leicester City. The program will cover all 380 league games. The program utilizes a database of words and sentences written by Yonhap reporters. It produces articles in three steps -- collecting data, writing sentences, and going through spelling and grammar checks. Through the editing process, the program reorganizes the structure depending on the results and whether the game included South Korean players. The program also gathers data from up to five different sources to identify incorrect information.